As you’ve probably read here before, I don’t make it into the city for shows very often. Partly because I’m out in the suburbs. And partly because the headliners go on so late, and I prefer early sets that allow me to get a good night’s sleep for work the next day. I also don’t usually go out by myself on Saturday nights. Those nights are reserved for family, so if it’s a Saturday night show, I usually don’t go; and if I do go, it’s rarely by myself. This performance broke all of those rules. It was a late event in the city on a Saturday night. 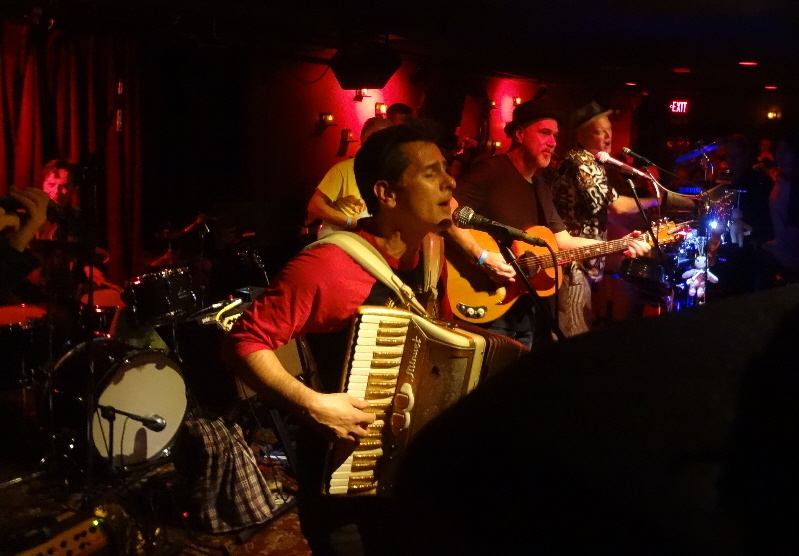 But it was a big CD release show for the highly-anticipated release of Mighty by Los Goutos, a band I had heard about but not yet seen – or rather, “witnessed” would probably be a better term. I also hadn’t been to the Lizard Lounge before. Hard to believe, yes, but that’s the case. It opened a few years after my first stint in Boston, which is when I started my music journalism career, and I hadn’t gotten to the venue yet since I moved back. So for this event on this night, I made an exception. 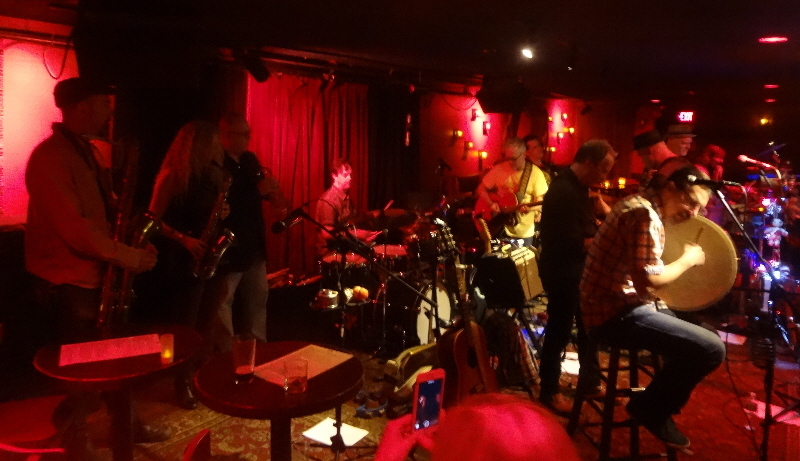 The evening began with a set by Los Goutos, followed by a set by Jimmy Ryan and Dana Colley, and then a set of “Los Goutos and Friends” (the band plus Jimmy and Dana; and I can’t be sure if there were others, as I called it a night sometime between 12:30 and 1:00). But I’m getting ahead of myself. From the very first notes, one thing became clear: Los Goutos is Spanish for “Party in a Box.” OK, I made that up. But it could be. 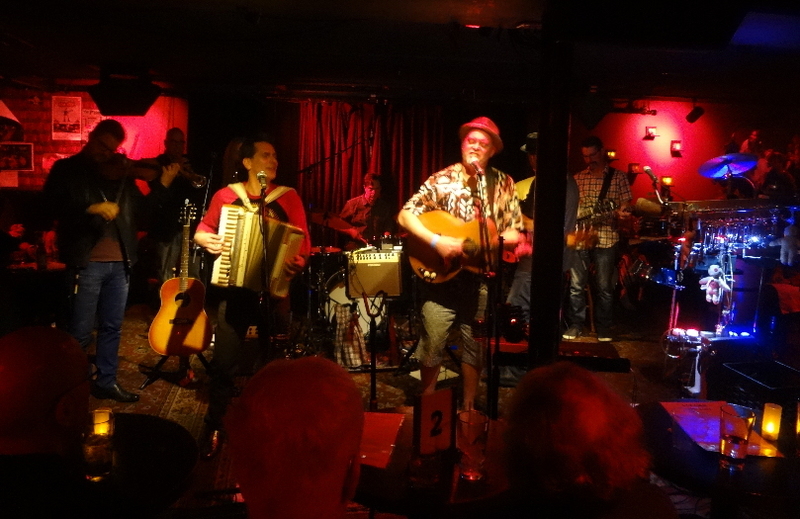 An eight-piece band including three singer-songwriters, the band takes up a lot of real estate – a stageful of musicians generating a roomful of fun. 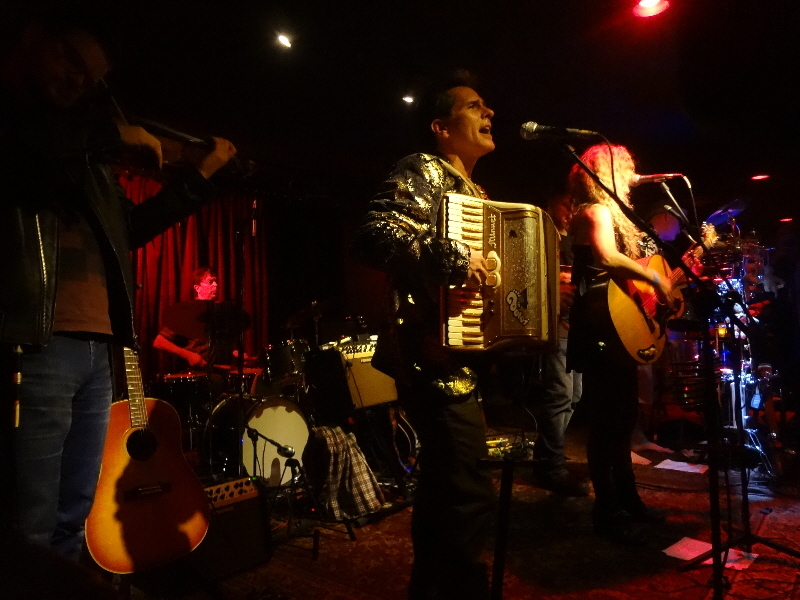 Stylistically, Los Goutos is a band with a quirky approach, lots of spastic energy, plenty of group-sung vocals, and horns, combined with songwriting talent. That’s a recipe for success in a college town like Boston. The energy of the evening reminded me of a typical college-town-favorite ska band, someone like the Mighty Mighty Bosstones or Chucklehead. But just the energy; Los Goutos’ sound is quite different. I know the band is generically categorized as Americana, but in reality it’s more like a demented hoedown, rockabilly on acid. The eight band members are Mike Eigen, Chris Gleason, Paul Stewart, Bruce Bartone, Shamus Feeney, Emily Grogan, Eddie Barrett, and Jakub Trasak. Multi-instrumentalists, let’s just say, rather than listing their many roles within the band, enabling multiple instrument and role changes during the set. As for the show itself, Los Goutos’ first set began with a beginning-to-end performance of Mighty. “Tequila Set the House on Fire” is sure to be a frequently-named fan favorite with its persistent energy, singalong-worthy lyrics (after a few listens to the disc so you can remember them), and guitar, horns, and growled lyrics splashing across a rhythmic wall-of-music bed. Party in a box. Or on-stage, rather. “Down to the Studs” is another standout track, a raucous number reminiscent of Weird Al-meets-cowpunk. The fourth song of the evening, “Can’t Hurt” was a notable change of pace; it’s still very much true to Los Goutos’ rhythmic Americana style, and quite an energetic song, but it was the first indication of the evening (and on the album) that Los Goutos doesn’t need to have all of its instruments blasting all the time to maintain its trademark sound. Past the Mighty portion of the first set, “Broken” was another standout song of the evening. Way too enthusiastic for its lyrical content, the song seems like a great shout-along number, nonetheless. The middle set of the evening was a treat, as well. A nice change of pace, perhaps, from the full-tilt energy of Los Goutos. 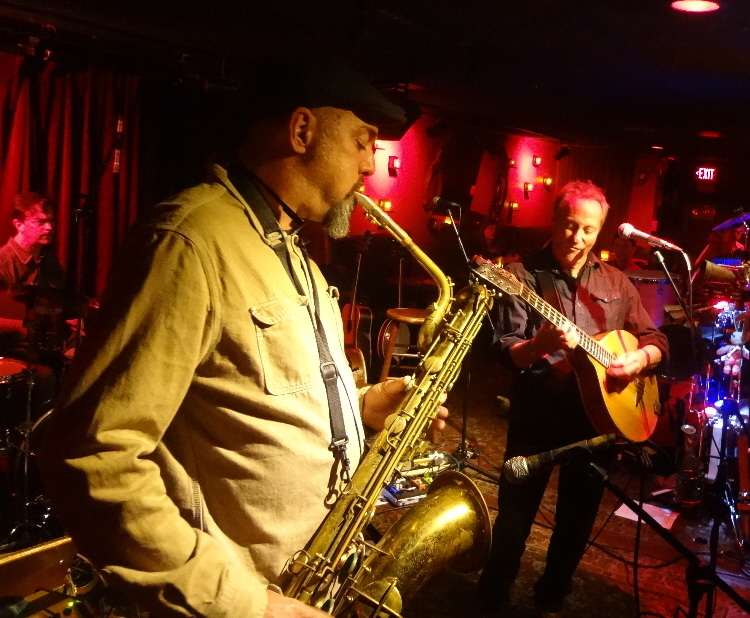 Mandolin player Jimmy Ryan teamed with Morphine co-founder, saxophonist Dana Colley. Especially on the back half of their set, they were joined by a member or two of Los Goutos for various songs. It was a fun set from a pair of top-shelf musicians. 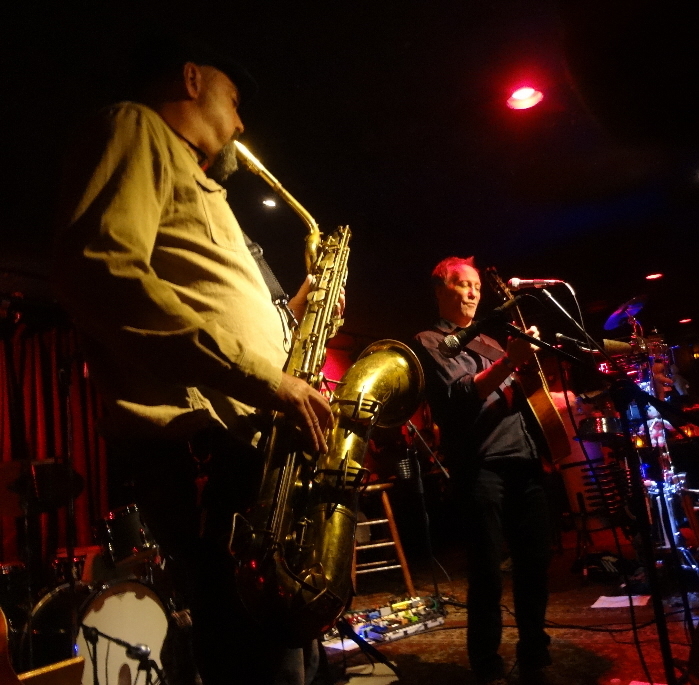 When they leaned on the sax, there was a bluesy jazz flavor. At other times, more singer-songwriter (with sax). Jimmy’s vocals are the sort that can cut through a very full sound. Frequently, I felt a Paul Simon-ish vibe from Jimmy’s singing – not that he sounds like Paul Simon, but his style and presence are similar. The song I noted as a standout was “Relax Your Body,” a number that shows great stylistic variety, at times a rolling blues number with a little deep Johnny Cash flavor, then some George Thorogood, maybe a little hipster, back to straight-up blues. This song alone was a terrific journey, indicative of the whole set. 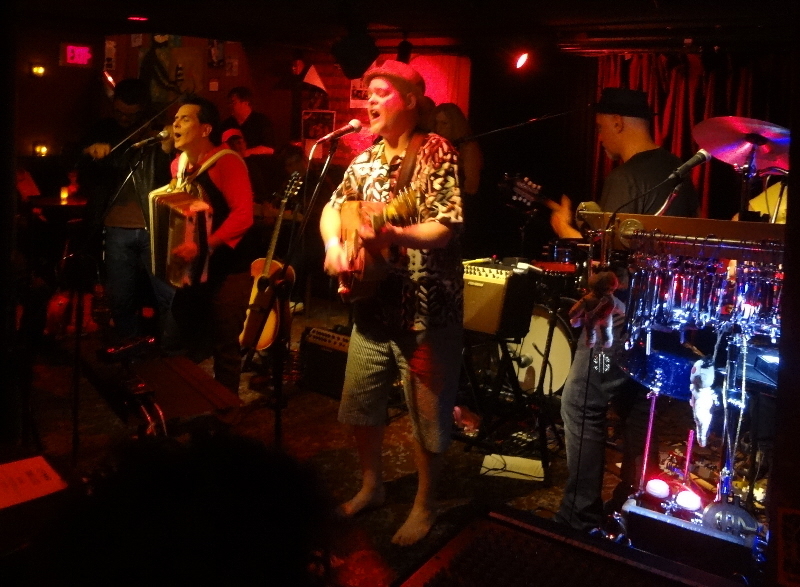 The final set was “Los Goutos and Friends.” In other words, Jimmy and Dana joined Los Goutos for a rollicking third set, a jam band extraordinaire (and an extremely full stage of musicians) that carried the party deep into the night. Though I only stayed for a few songs of the set – I wasn’t going to stay until 2:00 AM because I had responsibilities to get up for the next day – I can only imagine when the set ended an hour-plus later it must have been with reluctance. Because, you know… party in a box. 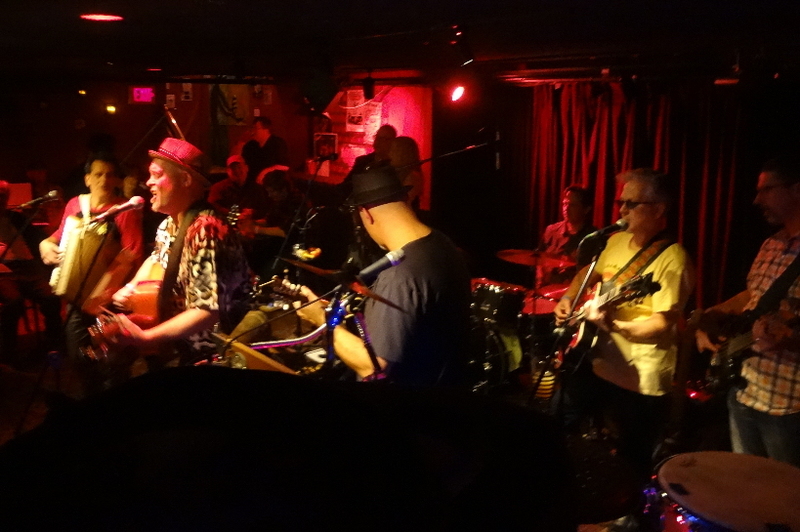 On Tuesday nights, The Corrib Pub features Eddie Scheer’s Tuesday Night All-Stars. Some weeks, he performs with his supergroup The Charles River Reprobates. Scheer, Blog favorite (and artist number 7 in my Blog-launching “Road Back to Music Journalism” series) Danielle Miraglia, Jimmy Ryan (who I had just seen perform for the first time a few days earlier), and Bob Enik, who are all featured on the band’s promo photos, were joined by Randy Bramwell on bass. Chris Leadbetter (who I’ve seen perform in Bob Malone’s band a couple times) is listed on the band’s Facebook page as the fifth Reprobate, but he wasn’t part of the band on this particular night. 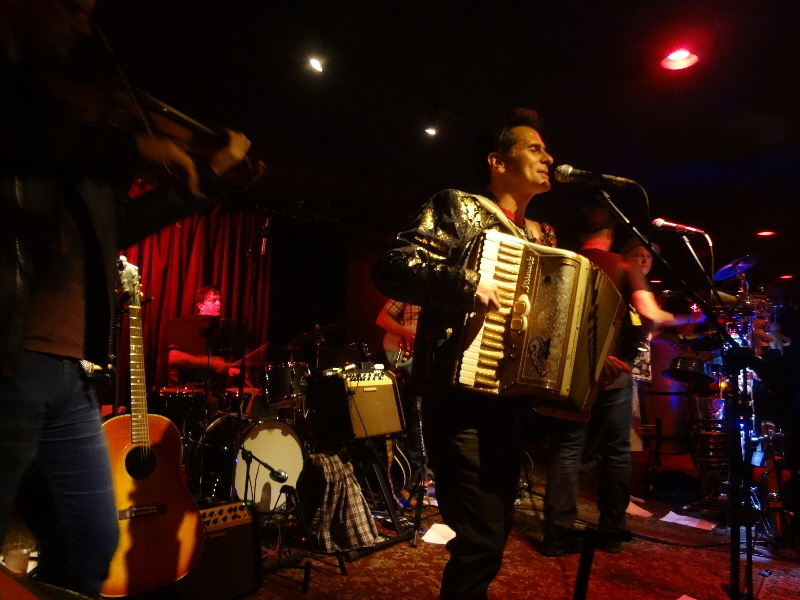 I was returning home from an evening business event in the city on Tuesday, October 23rd, and the Reprobates were performing that night, so I took advantage of the opportunity, stopped by the Corrib Pub, and caught most of a set. No notes, so no real review, but I’ll share a photo and suggest that when this group of Boston-area all-stars assemble, it’s always worth a bit your time. 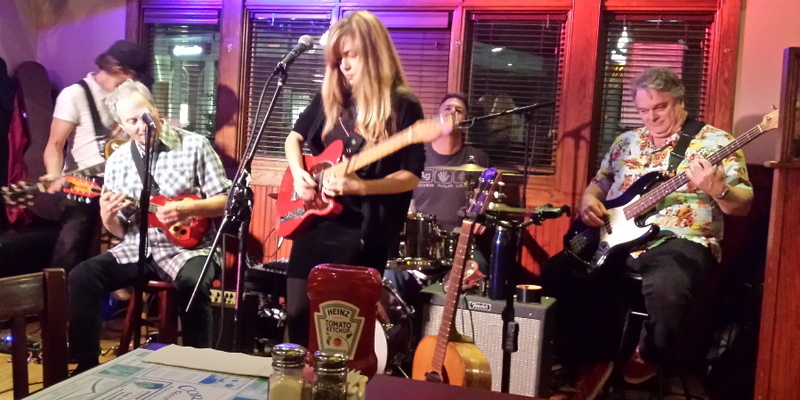 The evening leaned blues and blues-rock, with lots of classic tunes, and a whole lotta fun. Los Goutos are performing several times in the Boston area in the coming weeks, as you’ll see on the “Shows” page of their website. There’s their ongoing Sunday night residency at The Burren in Somerville every Sunday. And then there are some other big shows: a late afternoon/early evening gig Sunday, December 9th at the Aeronaut Brewing Company in Somerville; Los Goutos’ “Mighty Holiday Hootenanny” on Saturday, December 22nd at the Burren Back Room in Somerville; Saturday, December 29th at the Lizard Lounge in Cambridge; and Saturday, January 12th at The Bebop in Boston. You can catch Jimmy Ryan playing in a variety of groups, per the “Shows” page on his website: with Wooden Leg on Friday, November 29th at Sally O’Brien’s in Somerville; with Jimmy Ryan & Hayride on Sunday, December 2nd at Atwood’s Tavern in Cambridge; with the Sado-Domestics on Sunday, December 9th at the Aeronaut Brewing Company in Somverville; and with Jimmy Ryan & Hayride on the last Sunday of every month, December through April, at Atwood’s Tavern.